Growing tomatoes through indoor container gardening is a great way to keep fresh, juicy tomatoes on your table all year long. But there are a few common pitfalls that you need to be aware of. Let’s take a look at some of the most common issues, and what you can do to make sure that your indoor tomato plant stays healthy and productive. If you’ve ever seen massive, thriving tomato plants in a garden, you probably noticed that the plants were located in full sun. Tomatoes require a lot of sunlight – at least six to eight hours of full sun every day. Some of your tropical houseplants might thrive in the darker rooms of your house, but tomatoes will not. If you want to grow tomatoes indoors with natural light, you will need to situate your plant in a large and very sunny window that faces to the south or southwest. If you don’t have a large and sunny south-facing window that gets at least 6 hours of full sun, you should consider purchasing an indoor grow light to keep your plant happy and healthy. In very rich garden soil, you might be able to grow tomatoes with minimal additional fertilizer. But the environment in an indoor container is much different than rich garden soil. Think about the size of a large tomato in your hand. Tomato plants produce those large tomatoes using nothing other than sunlight, water, and nutrients from the soil. Make sure that there are plenty of nutrients available in the soil so that your tomato plant can continue to produce large fruits. Start fertilizing as soon as your plants are 5 or 6 inches tall, and then fertilize once a week. Even if you’re accustomed to using solid fertilizer pellets in your garden, you should consider using liquid fertilizer indoors to reduce insect infestation issues. Tomatoes have large and expansive root systems. They will do best when they have ample room to spread out without becoming bound up around the outside edges of the container. There are two things you can do to encourage a healthy and well-distributed root system. First, find a very large container for your mature plant. The container should have a volume of at least 5 gallons, or be at least 24 inches in diameter. In smaller containers, your plant will quickly become root bound. If this happens, your plant will likely become stressed, and it may not produce fruit. Second, don’t just plant your immature plant directly in that large container. Start in a smaller container, about 1-gallon. 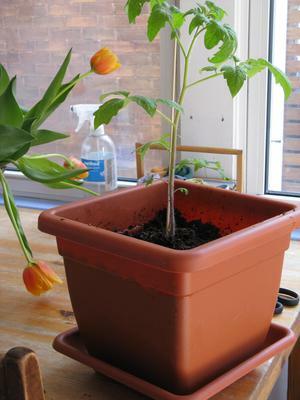 When the tomato’s roots reach the edge of that small container, move it up to a larger pot, about 2 gallons. Finally, when the tomato’s roots have reached the edge of the 2-gallon container, you can move it into its final home in the 5-gallon container. Your chances of success will be infinitely greater if you choose a variety of tomato that is well-suited to growing in a container indoors. Some varieties are more likely to thrive in relatively low light with a limited amount of soil available. Choose small, upright varieties that won’t grow to take up your whole room. Some great choices are Red Robin, Florida Petite, Patio, and Tiny Tim. There are also several hanging varieties that can thrive indoors. Just be sure that the structure you use to hang the pot can support the weight of a large container. When choosing your plant, pay attention to whether the variety you choose is determinate or indeterminate. Determinate tomatoes stay more compact, and yield all of their fruit at one time. Indeterminate plants grow larger vines, and they produce fruit continually throughout the season. Follow the guidelines above and you’ll be able to enjoy fresh juicy tomatoes grown right inside the comfort of your own home. Keep a close eye on your plant as it grows. If you see signs of stress or disease, take action immediately to remedy the situation. Have you grown tomatoes in indoor containers? Do you have any tips or tricks that might help someone else who is trying for the first time? Drop us a line in the comments section below to share your experience. Best of luck! James G. Craig is a gardening enthusiast who splits his spare time between growing vegetables, preening his flower gardens, and blogging about his experiences at Gardener Corner.